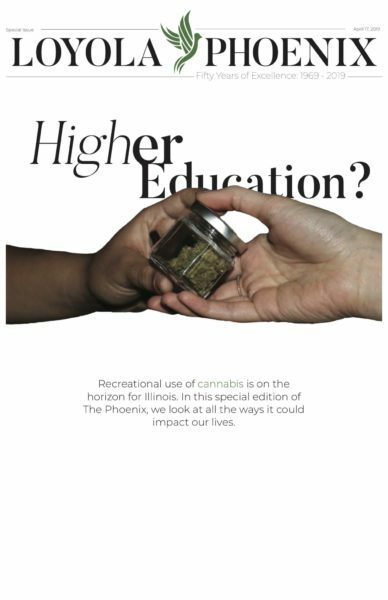 On March 22, The Phoenix Editorial Board published an editorial regarding the problems within Loyola’s Greek Life community. The article makes sweeping negative generalizations and veiled assertions that anyone in Greek Life is engaged in lewd conduct with mannequins, participates in hazing and is tone deaf to the values we profess. The article appears to be based on the premise that any incident that happens within an individual sorority or fraternity is condemning of the entire system. Let me be the first to say — ask anyone in Greek Life — that we collectively disavow the actions of the chapters that have been kicked off campus. Any chapter that strays from its values, Loyola Community Standards or basic human decency does not deserve to be a part of our community. No member of Greek Life will disagree with The Phoenix here. However, where we do disagree is in generalizing or asserting that this is the norm. It is not. To say that members of Greek Life are all engaged in these behaviors because of two isolated incidents over the past three years is the logical equivalent of saying that every Loyola student is a thief if one of our fellow students were to be caught doing so. What is even more troubling about this piece is that it’s continually being defended as being supported by facts. There are two facts in this article: Sigma Pi was kicked off campus, and Sigma Alpha Epsilon was kicked off campus. Everything else that is stated are baseless and damaging claims that alienate approximately 1,200 Loyola Students. I will address them here. This claim is not rooted in fact nor are any specific instances of this happening is referenced in the article. Again, this claim is made without any reference to a specific instance of anyone blaming others rather than recognizing Greek Life is nationally plagued by these problems. Had the Editorial Board done some research, it might have been surprised to find that my chapter Sigma Chi, Lambda Nu was instrumental in the creation, development and roll out of Sigma Chi’s new national pledge program, a program whose primary objective is to eliminate hazing from Sigma Chi chapters nationally. Lambda Nu, during the two academic semesters of 2016, operated as a pilot chapter for this program. We were selected by our national headquarters to test and give feedback on the program before it was implemented to all chapters across the country. At our national leadership conference, our executive board participates in conversation with our fellow brothers about hazing, the pilot program and how to improve our risk management strategies in our respective chapters. To say that we are “[blaming] others for recognizing a problem” is ludicrous. We have taken constructive steps to better our organization and it’s hugely offensive and irresponsible of The Phoenix to assert otherwise. Again, there is no support for this claim. The fact is that every chapter has an internal investigative review board, often called the Judicial Board or Standards, that penalizes members for conduct that is not in line with our values. These entities are effective and have resulted in brothers and sisters being removed from our organizations. In addition, we have a larger body called “Greek Conduct Board” which is composed of members from every chapter’s Interfraternity Council, Panhellenic and Multicultural Greek Council which holds chapters accountable for their actions against a group of peers. Frankly, no. This paper wants to further the idea that Kappa Kappa Gamma’s fundraising ($10,000) for one of their sisters who is currently critically ill in an ICU is discredited because of another organization. This paper wants to say that Phi Sigma Sigma’s Stroke Awareness, which honors one of their sisters who actually lost her life to a stroke, is discredited. This paper wants to say that the $40,000 Chi Omega raised for the Make-A-Wish Foundation is discredited. This paper wants to say that the $10,000 Alpha Delta Pi raised for Ronald McDonald House is discredited. This paper wants to say that Alpha Sigma Alpha’s current event that benefits the Special Olympics is discredited. This paper wants to say that the awareness Alpha Chi Omega raises for victims of sexual assault is discredited. This paper wants to say that the work Delta Sigma Pi does for The Heartland Alliance is discredited. This paper wants to say that the work Tau Kappa Epsilon does for St. Jude’s Children’s Hospital is discredited. This paper wants to say that the work that Beta Theta Pi does for Misericordia is discredited. This paper wants to say that the over $200,000 that Sigma Chi has raised for cancer research is discredited. To that I ask, what have you done? We live our values, we make positive contributions and we absolutely do not partake in the denigration of other organizations. I could continue, but I think the lack of research has been substantiated. This pedantic and self-righteous editorial has accomplished nothing except the disparagement of an entire community. You messed up. Own it. Apologize. While your board is entitled to its opinion, I hope I have convinced you that it’s wrong, unfair, damaging, offensive, non-factual and alienating. I encourage The Phoenix to talk to members of the Greek community; we all would love to tell you why going Greek is a good thing.